Tony Eubanks has been interested in art science since he was three years old and watched his uncle and cousin draw warplanes. Even though his dad was a test pilot, it wasn't the planes that really fascinated Eubanks, it was the drawing. As a child, he always looked at life with an artist's eye. He once told a writer for "Art of the West" magazine, "Everything around me held potential. I drew anything I could think of from sports pictures to battle scenes, from movies to neighborhood houses to portraits of people; you name it found something to draw around every corner." By the time he was seven, his mother had given him his first set of oil paints. Frequent family moves stymied his growth in art, and he actually intended to study ranching when he enrolled at Texas Tech University in 1958; his dream was to become a cowboy. But animal science classes bored him. Walking by an art class one day rekindled his early interest in art. He transferred to North Texas University, which had a more comprehensive art program. After graduation and marriage to Brenda Banks, he continued his studies at the Art Center in Los Angeles. He recalls his time there as "the most intensive training I had ever had. Everything finally clicked for me and my art came together all at once." Returning to Texas, Eubanks worked for several art agencies then began doing free lance illustration assignments for "Reader's Digest", "National Geographic", "Time", RCA, NBC and several other publishers. By the mid-seventies he was growing tired of the hassle of illustration work and began placing a few paintings in Santa Fe galleries. Since then, Eubanks has been noted for the diversity of his subject matter - western paintings, landscapes, seascapes. Frequent travel to foreign countries only serves to whet his capricious appetite for painting a variety of subjects, but always with a timeless, charming and colorful appeal. He is also attracted to the dramatic lighting that comes with early morning or late in the day light. He says, "Painting different subjects keeps me a lot fresher and interested in what I'm doing. I guess I'm attracted to new themes in the same way an actor is attracted to new roles." Eubanks' work was most recently shown in the Masters of the American West at the Autry Museum in Los Angeles, and the Northwest Rendezvous in Helena, Montana. 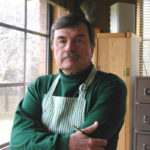 He has received numerous awards for the Salmagundi Club of New York and the Copley Society of Boston. He is a signature member of Oil Painters of America and is represented in many well-known private and corporate collections, including the Library of Congress in Washington.